Friday Harbor is a busy port with boats, ferries and float planes coming and going at a frantic rate. I sit in the Bean Cafe with other hyper-connected wayfarer’s, tapping away at my quaint laptop, churning out this news dispatch from the Salish Sea. I’ve dialed back on the barrage of bad news endlessly reported by the media industry to make my own, to shape these fragments– the discombobulated vessel of my prose– into some kind of order. With the need for quick passages to make the San Juan’s before the full moon I’ve had little time to pause and reflect on the true reason for the voyage. 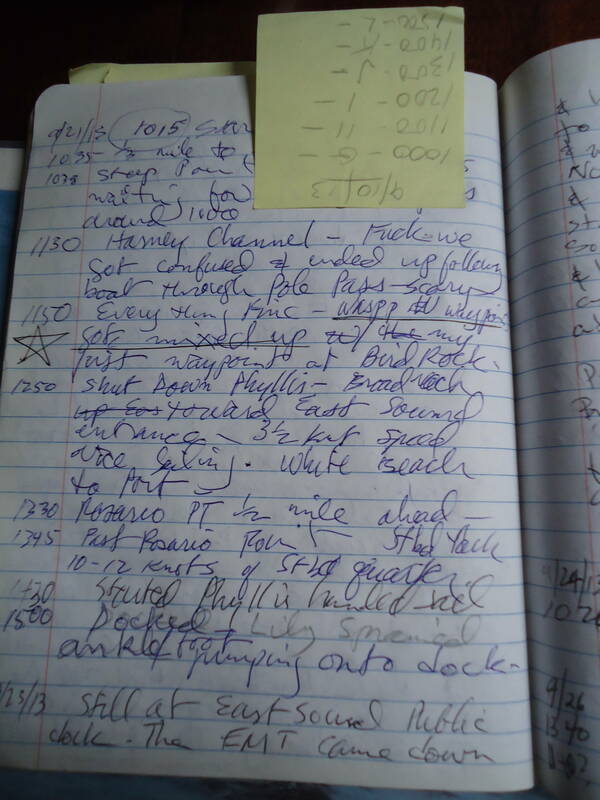 Scattered among a pile of cheap, tattered composition books are fragments of my attempt to evoke, in written words, the ineffable impulse that draws me ever further toward a north only dimly seen on the drive-in movie screen of my dreams. Old Hand voyages into the Sea of imagination, over the vertiginous depths of the unconscious. Her course is shaped by a vision glimpsed when I first beheld the vast azure expanse from my dad’s early 50’s station wagon as the Spencer family loudly tooled down Highway 101, fleeing the smog and squalor of L.A.
With my Brother Slim, I would practice the fine art of “body whomping.” It was then I first felt the sea’s loving caress, as well as the thumping shore-pound that handled my young person with all the tender ministrations of Freddy Blassie. Yay, even Byron penned florid poesy to the green muse of body surfers in his epic Child Harold which, to this very day, remains blissfully unread by yours truly. It is this same feeling of ecstatic immersion in the hylic element of Poisidon that pulls me toward a vaguely descried northern way-point. It is a lapis blue vision of eternity seen reflected on the whirling eddies of Deception Pass. Here and now, at this particular waypoint in time, I see the abysmal, turbid darkness overlaid by the counter-clockwise circulation of the divine light. The 30 mile passage from Port Madison to Port Townsend is marked by the doleful names of voyages that came to grief on the Salish Sea. 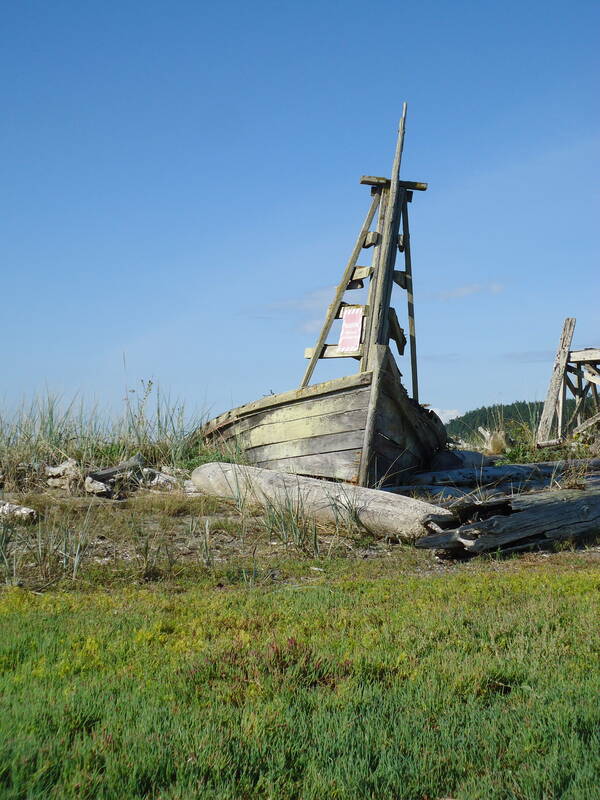 It is the saga of sunken tin-pot steamers who plied the vertiginous depths of Admiralty Inlet and now lie some fathoms deep among the fouled chain of time and memory. 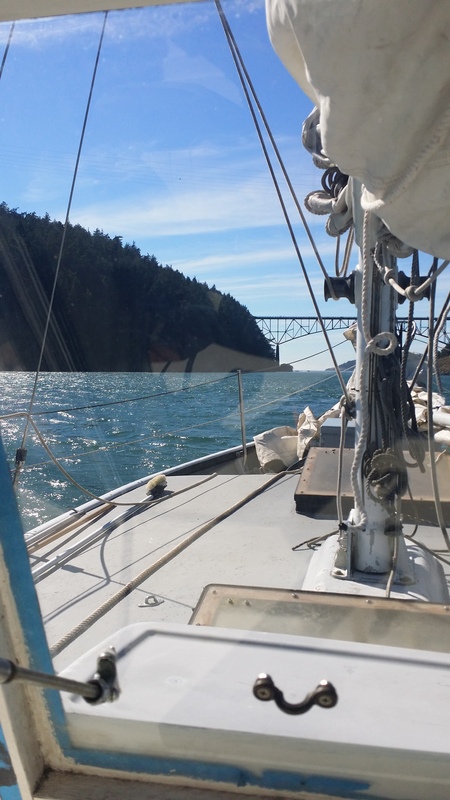 The place names along the first leg of Old Hand’s forth-coming voyage to the San Juan Islands bear testament to historic, tortured founderings: Point no Point, Skunk Bay and Foulweather Bluff. Perhaps the names are meant as caution to jaded yatchies who, besotted by the mirror calm of the convergence zone and assured by their virtual, abstract trajectories, sail blithely on over the sun-dappled main while toasting a lowering Margarita sky. What are these names but vague appellations foor that stubborn tyranny of tide and rock that mark this bewitchingly placid and, by turns, malevolent stretch of sea? And what are all our errant eastings, leewardings and embarkations but the the soul’s recurrent flight into the dream time–the Homeric drive by which all voyages are undertaken–and part of the eternal, unquenchable drive toward the further, mythic shore. 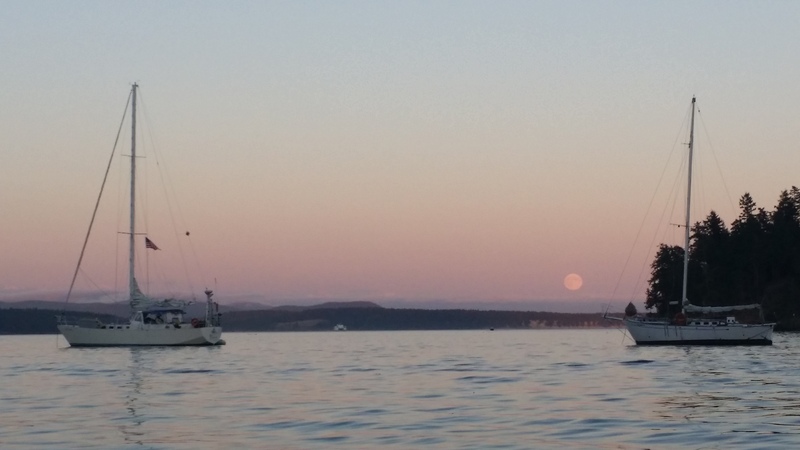 My plan is to sail with the new September moon toward a not-too-adventurous landfall in the San Juan Islands and there to blithely hang amid the encantadas of the north; to seek, to groove, to go where no green lubber has gone before, that my soul might find solace, inspiration and release. Who knows? Maybe even that old Miphisto of the sea, that horn-fisted coot with the line-squall scowl might loom again in the night, his gaunt profile etched against the thundering flash of doomsday. For none but Saturnius McWhirr can skipper Old Hand proper. None but he can set the serpentine track of this labored narrative on a course that is steady and true. I finally made it home after being hammered by storms and held down in the lee of Port Hadlock for nearly a week. I’ve had little internet access and only able to make an occasional post. It’s good to be back and have more time read and interact with my fellow bloggers. I’ve been anchored in Port Hadlock for 5 days. Actually, after being pinned down here so long I’ve come to think of it as Port Headlock. As soon as I start to haul in rode, a sound rises from the far north, a deep rush of sound that gives me pause, and my hand is stayed from weighing anchor. Since the Equinox, the weather has taken a nasty turn, with savage gusts from the Austral quarter of this turbid globe cast into the swirling cosmos. After long, night-watches, I see the gale steam the weather-glass a frenzied, vaporous scene of genesis. The glass is the vessel which holds the primordial spark and the damp, hylic goo of the Prima Materia in a seething, Hylic confluence. The torn north hangs rain-slanted like a black curtain fallen over the final act of a Doric sea tragedy. Like I said, it was a nasty storm with gusts to 70. But now I pace the deck and see over the port beam, young men learning the old shipwright’s trade at the Northwest School of Wooden Boat Building. A vessel went by that’s based on the old longboat design of Vancouver’s rowing/sailing launch and skipered by a young, pretty lass who calls from the bow with all the assurance of an old salt. Does my heart good to see the old tradition of working sail carried on by such eager hands. We left Jones Island with the start of the ebb on a calm, overcast morning and headed south-east toward our first way point at Steep Point on Orcas Island’s East side. 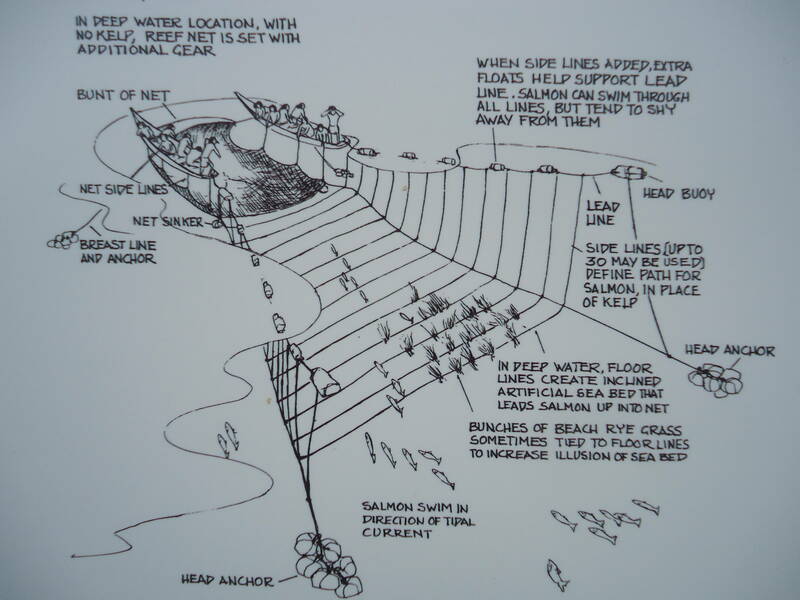 I’d plotted our course through one of the San Juan Island’s most treacherous passages the day before. Our track was to take us into the middle of the labyrinthine Wasp Islands, through Harney Channel to East Sound in time for our dance. I’d cross-referenced Captain Jack’s and the Canadian Currant Atlas and, with a sharp pencil, drawn our course on the chart with the way points and estimated arrivals times. I was actually a bit proud of my fore-sight, and hoped it might inspire in Lily a greater trust in my navigational skill. Lily had given me a T-shirt that said sharp and focused. Maybe she thought it might help. When we reached Steep Point, the next way point appeared on the GPS screen directing us somewhere south-west into some nasty-looking rocks. Since our intended track was south-east, I knew something was wrong. Major anxiety set in. The ebb was taking us east past a small Island to starboard, while ahead a few miles, was a small opening toward which a sailboat was motoring. At Lily’s suggestion (she was remaining unusually calm in all this,) I followed. As we neared, the pass actually appeared smaller. A torrent of green water flowed over the jagged rocks to starboard, when suddenly I saw a woman in the cockpit of a C-Dory next to us beckoning with a reassuring look and a gentle movement of her arms. I’d gotten only a fleeting glimpse of her, but her radiant image will forever be etched in my memory. The waving motion with which she guided us rocked with her boat like a movements of a Sufi Zikr. It was an angelic vision guiding Old Hand’s errant crew through the twisted channels of the world toward salvation; to chasten pride of seamanship and forgetfulness of the true purpose of our voyage-of which we might lose sight while navigating the labyrinthine island passes. Though our “navigation” of Pole Pass may have been unintentional, it reminded me of our deeper intention. After all, we are emissaries of the Dances of Universal Peace, come to bring the message of unity as taught by Hazrat Inyat Khan and Samuel Lewis-to bring the wisdom traditions of all faiths into full body awareness through the ancient tradition of sacred dance. Thank you bright Angel of Pole Pass. For you there shall always be an honored page in the tattered log of Old Hand. Lily hurt her foot when we docked at East Sound for our dance. Then yesterday, a storm blew up from Southeast, blowing a good 35 knots with gusts to 40. Old Hand took a hammering at the public dock while Lily lay below getting seasick. But the local EMT team were there in no time to get her off the boat, up to the nearby Oddfellows Hall where we had a wonderful event despite Lily’s injury. It was a sweet circle praying for peace in this stormy world. In the mid 70’s I had a studio in Eugene. 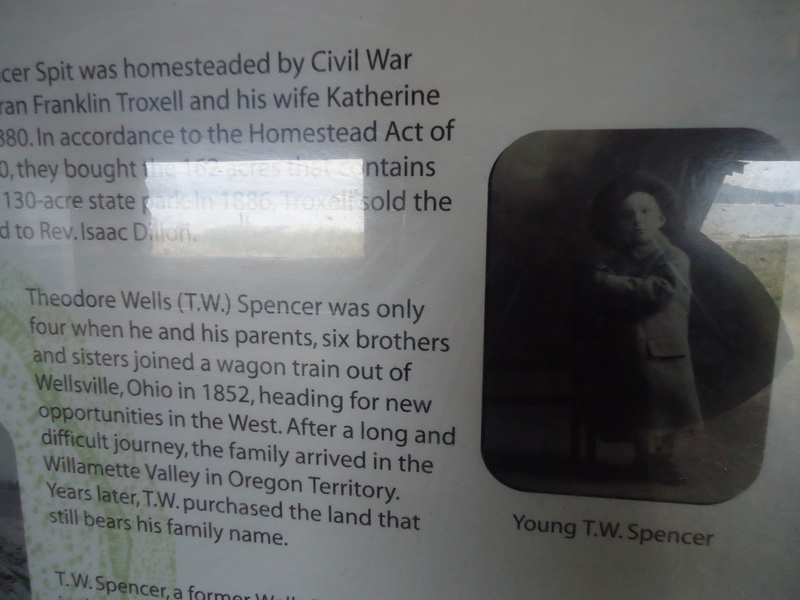 Nearby was a pioneer cemetery where stood a tall, gray weathered tomb which housed an early patriarch of the Oregon Territory named Septembus Spencer. While I won’t deny my memory may embellish the facts, this outlandish moniker has stayed with me all these years. 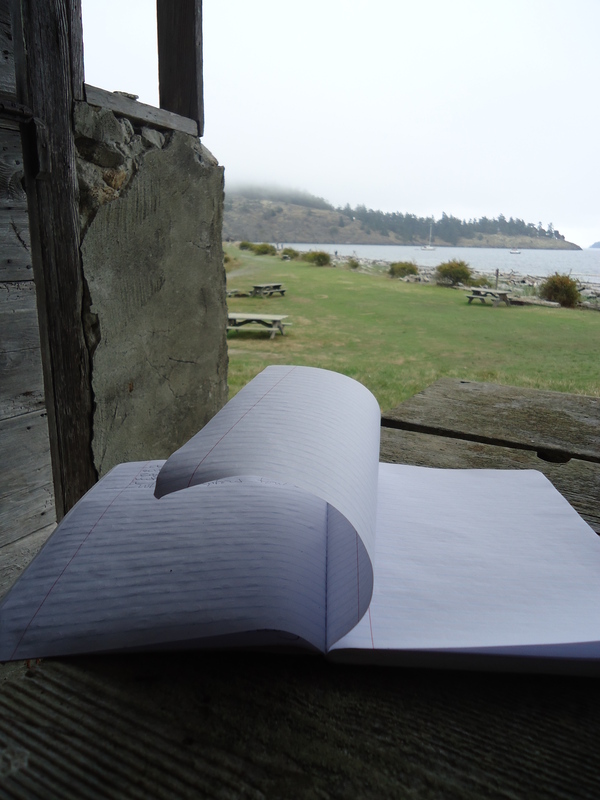 Now I find that one of Willamette valley venerable line of Spencers had made his way further north to this stormy spit on Lopez Island’s east shore. As though by a master sculptor’s hand, Equinoctial storms have carved cyphers into the rough stonework of the storehouse. Apples still fall from the trees he planted on the grassy knoll. Septembus comes from Septentrio, which is Latin for North. On this gravel spit formed with perfect symmetry by alternating currents are seen middens of a tribal fish camp that had been used for over 3,000 years. Though I bear no relation to the Eugene and Lopez Spencers, I find it strange to arrive at the most northern outpost of those Northwest settlers-that venerable line whose family tomb I saw in my earlier days. It is their most, so to speak, Septentrionic point. I take heart in knowing that the same northern, wayfaring spirit calling us toward these enchanted Isles inspired the peregrinations of T. W. Spencer-that the same pole star he set his course by is the way point toward which Old Hand shapes her course. I was taught by a Cowlitz elder that the cardinal directions are more than physical points on the compass, but spiritual states which must be embarked upon with full awareness of all their various qualities. The tide flows into the lagoon at full flood like the rushing green flow of the Willamette River by which I sat staring so long that, when I rose, the solid banks seemed to move with the same fluid motion as the water. The sacred land is everywhere-is already won. It is somewhere in Harney Channel (Harney again!) The Center is in the old Odd fellows Hall on Orcas Island where we hold our Dance of Universal Peace on this Sunday. The universe revolves around Old Hand’s keel as we voyage to the spiritual state of North; to honor the wisdom teachings of all faiths that ever points us toward the true polestar. 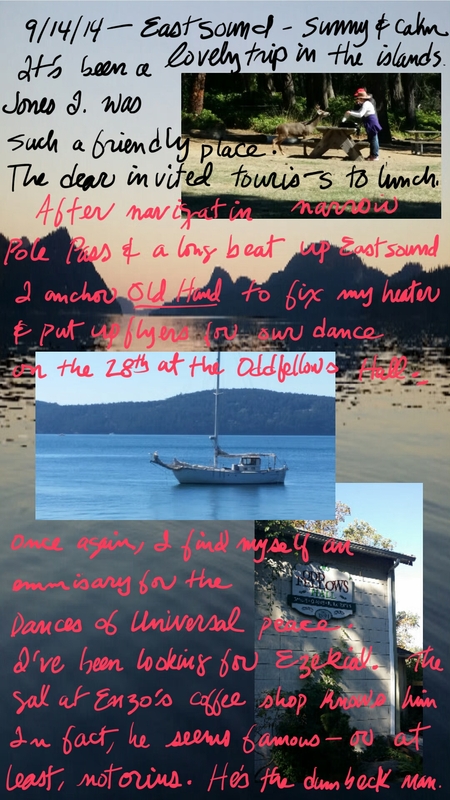 Lily and I have been making flyers and organizing our September 22nd Dance of Universal Peace in East Sound, Orcas Island. Our voyage has a direction beside that which the winds take us. From the vantage point of the Doctor’s Office coffee shop (it was an actual doctor’s office), I watch all manner of craft and float planes enter and depart Friday Harbor. Old Hand lies anchored in 9 fathoms off the Oceanographic laboratories on the north east shore. We are leaving later today for either Spencer Spit or Fisherman’s Bay on the north end of Lopez Island before our event. it’s not really our event, but part of a tradition-a spiritual community that exists all over the world. Here’s Lily leading a song/dance she wrote based on the Amitabha meditation. I may have gotten a little to free with the effects, but you can maybe get the jist of it.